Image(s): Product image(s) are for reference only and should be considered illustrative. WHEN WEIGHT MASS AND MUSCLE GAIN IS YOUR GOAL! In order to gain overall body mass, you need to consume many more calories per day than you burn. When you train hard, you burn a lot of calories. Digesting solid foods takes much needed energy from your body when you are trying to train and recover. Consuming a high calorie liquid supplement like Weight Gain Protein , facilitates adequate amounts of daily calorie intake for mass gains. Gain Weight – Complete calorie source for gaining weight While protein is important for building muscle, carbohydrates and fat are necessary for gaining overall body mass. ProteinCo’s Weight Gain Protein is the right combination of protein, carbohydrates and fat to fuel your body completely. Lean Muscle – Protein for promoting muscle development The amino acid profile in Weight Gain Protein is ideal for building lean muscle as well. Consumed twice daily as recommended, you can keep your body in a muscle building state which may lead to better and faster lean muscle mass development. Energy – Long lasting energy sources We have added simple and complex carbohydrates to our Weight Gain Protein formula to boost your energy instantly and then keep it elevated for hours. Maltodextrin is a complex carbohydrate that burns long and slow. The result is consistent energy throughout the day that has you ready for your workout at any time. Active Lifestyle – Keeping you fueled for your active, busy life Many consumers, particularly those leading an active lifestyle, miss getting proper nutrition at some point during the day. Weight Gain Protein is a complete meal on the go to ensure you get enough calories when you need to rush out the door in the morning or have that unexpected meeting during your planned lunch time. Our powders all mix easily and completely so all you need to do is take the powder in a bottle and mix with water in an instant. Mixing it with fruit and juice in the blender makes an excellent breakfast smoothie as well. Weight Gain Protein is food on the go! The ProteinCo’s Weight Gain Protein is a massive 793 calories per serving powdered drink mix! It’s a specifically formulated blend of protein, carbohydrates and just a little fat to be a complete body mass gaining supplement. Some have argued that whey protein concentrate is a better overall protein due to being in a more natural state from less processing. We agree, which is why this is the protein source in Weight Gain Protein. As long as you don’t have lactose intolerance, you are well advised to use Weight Gain Protein to assist with gaining mass for sports like hockey, rugby, American football and bodybuilding. AMINO ACIDS AND CALORIES FOR BODY MASS GAINS! Why ProteinCo’s Weight Gain Protein? When you want to gain body mass, you need complete nutrition sources and a lot of calories. Our Weight Gain Protein is that gluten free supplement. Packed with 34 grams of protein and 162 grams of carbohydrates per serving, you get nearly 800 calories to supplement other calorie sources you consume throughout the day. Sometimes it’s hard to ingest the number of calories that you need to gain mass, it’s just hard to eat that much food. Weight Gain Protein is perfect for getting in a lot of calories quickly and easily. An adaptable gainer supplement to meet specific needs Hopefully you have noticed by now that most of the products we offer in the ProteinCo line are designed to be easily personalized for your specific needs. Rarely can a product be a “one size fits all” supplement. Therefore, we facilitate adjustments by offering other synergistic powders whenever possible. Weight Gain Protein lends itself particularly well to adding L-Glutamine, Creatine Monohydrate and any other powdered product we offer that may meet your goals precisely. NATURALLY OCCURING AMINO ACIDS TO BUILD MUSCLE! Whey protein concentrate is a tremendous source for all essential amino acids including BCAAs. It’s also high in many of the non-essential amino acids so you get a powerful dose of muscle building power. Should you desire more protein impact, combining with our BCAA Powdered Drink can result in the perfect amino acid packed supplement to meet your specific needs. Whey Protein Concentrate Getting a more complete protein, one that has key enzymes and nutrients intact, may be more beneficial to some consumers. Whey protein concentrate keeps carbohydrates, fat and enzymes intact as opposed to whey protein isolate where those nutrients are processed out. For those not concerned with weight gain, and those looking to gain mass in particular, Weight Gain Protein from ProteinCo Canada is quite possibly the best choice for you. Maltodextrin Since this product is designed to be a high calorie supplement, adding additional carbohydrates to achieve an optimal nutrient ratio is specific to our formula. We use gluten free maltodextrin for this purpose. A secondary benefit to you is the complex nature of this carbohydrate. This means it’s a long, slow burning energy source for several hours. It takes a bit of time for maltodextrin to raise your energy level. Because of this, we added a small amount of fructose to provide a quick energy boost until the maltodextrin kicks in. We think you will agree our Chocolate flavored Weight Gain Protein is very tasty! This isn’t by accident. Our formulators are tasked with making the best tasting product possible. It’s important to have a great tasting product combined with maximum performance so you will be motivated to consume the product as much as you need to. Q – What’s the difference between fructose and maltodextrin? A – Fructose is a simple sugar derived from fruit. It’s a natural sweetener that can promote insulin response for recovery and give you a quick rise in your blood sugar for instant energy. Maltodextrin is a mostly complex sugar that is best for providing long lasting blood sugar elevation and sustained energy. Weight Gain Protein has both so you get an instant boost to your energy then the prolonged energy burn to get you through your day and your workout. Q – How is whey protein concentrate different from whey protein isolate? A – Whey protein concentrate is not as processed as whey protein isolate. One of the values of concentrate is there are carbohydrates and fat intact so you have a more natural calorie source. Research indicates whey protein concentrate may be more effective as a protein supplement. It’s the best choice if added calories and carbohydrates aren’t a concern. If all you are looking for is additional protein, our Whey Protein Isolate is available for that purpose. GET BIGGER AND STRONGER FOR SPORTS THAT DEMAND SIZE! Q – Does more mass just mean bigger muscles? A – No. While increased lean muscle mass is part of increasing overall mass, increased mass and consequently weight means more muscle AND a higher percentage of body fat. Not everyone is concerned with weight gains associated with increased body mass. Athletes participating in sports such as hockey, rugby, and American style football, often desire to increase overall body weight along with muscle and strength. Weight Gain Protein is designed specifically for that purpose. Medium-chain triglycerides, natural and artificial flavor. The information you find at the ProteinCo is NOT a substitute for medical advice. ALWAYS consult your doctor or pharmacist. Do not use any dietary supplement as a replacement for conventional care, or as a reason to postpone seeing a doctor about a medical problem. Tell all your health care providers about any complementary and alternative practices you use. Give them a full picture of what you do to manage your health. This will help ensure coordinated and safe care. Also, be sure to look at Ingredients or Other Ingredients. Substances such as Artificial Color and Flavor, Sucralose and others that aren’t in the table may be something you choose to avoid for personal reasons. If you are in doubt about whether or not our product contains an ingredient you are adverse to or that may be manufactured in a plant that does, contact The ProteinCo before purchasing or consuming the product. The ProteinCo is committed to bringing you Value, Quality and Results backed by our 40 Day Money Back Guarantee! Incredible Value - Buy direct from the factory and qualify for FREE Shipping in Canada! The ProteinCo’s commitment to you is in providing the highest quality product at the best possible price. One of the primary ways we accomplish this is by bringing the product directly to you rather than using retail outlets where the middleman drives up the price. Every order over $99 qualifies for FREE shipping which adds even more value. 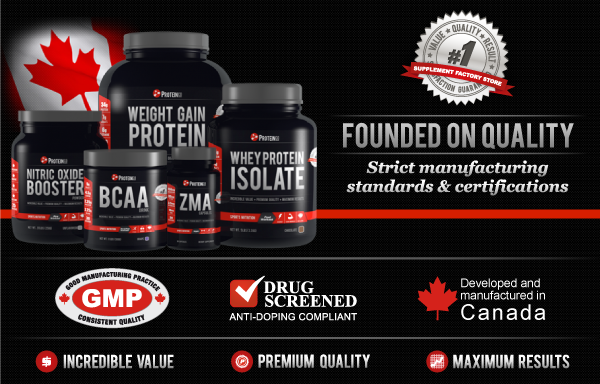 Premium Quality - Strict manufacturing standards and certifications As with all ProteinCo supplements, Weight Gain Protein is manufactured under strict cGMP procedures to ensure the quality you deserve. You get the highest quality amino acids, carbohydrates and supporting nutrients completely free of impurities. This translates to peace of mind for you no matter what your reason is for wanting pure, healthy supplements. Maximum Results – Specifically formulated to work as promised We formulated Weight Gain Protein to be as effective as possible for the needs of everyone. You'll see the desired results in a very short amount of time we are convinced. As with many of our products, Weight Gain Protein lends itself well to personalizing for your specific needs. If you find adding another type of protein, or more amino acids and carbohydrates better suit you, then by all means add one or more of our other products to make this drink uniquely yours. ProteinCo's Whey Protein Isolate, Whey Protein Blend, BCAA Powder, or Waxy Maize can be some great additions. Money Back Guarantee - 40 day hassle free refund policy If for any reason any product is not satisfactory, return it to us for an exchange or a full refund. Timing Drink up to three times daily. Pre Workout Taking Weight Gain Protein between meals mid-morning and mid-afternoon is ideal if that fits with your schedule. If you train early in the morning, utilize it as a breakfast shake consumed an hour or more before your workout preferably. If you don’t have enough time to digest before your workout, consume sometime after and then at another point later in the day. Post Workout Adding some Weight Gain Protein to our Amino Recovery can boost the calorie content in your recovery drink so it’s more ideally suited for your specific needs. Mix the two powders together in the desired ratio, then add water, shake and drink immediately after your workout. Everyone has different needs based on body size, gender, training intensity and metabolism. Experiment to find out what combination works best for you.